FREE SHIPPING to continental US addresses for orders above $150. Ready-to-use workouts prepared by GUN-eX® master trainers, just select one from the list and you are ready to train. Several premade workouts for each level of difficulty. Separate classes for individual and group training. New innovative warm-up and cool-down exercises. Free download for iPhone and Android. Intuitive user interface for creating your own workouts with just a few finger taps. Create classic interval timer or design complex workouts using ladder and pyramid timers. Simply drag the slider and immediately see how long your workout is going to be. Add selected exercises from GUN-eX® Movements Database or add your own custom ones. 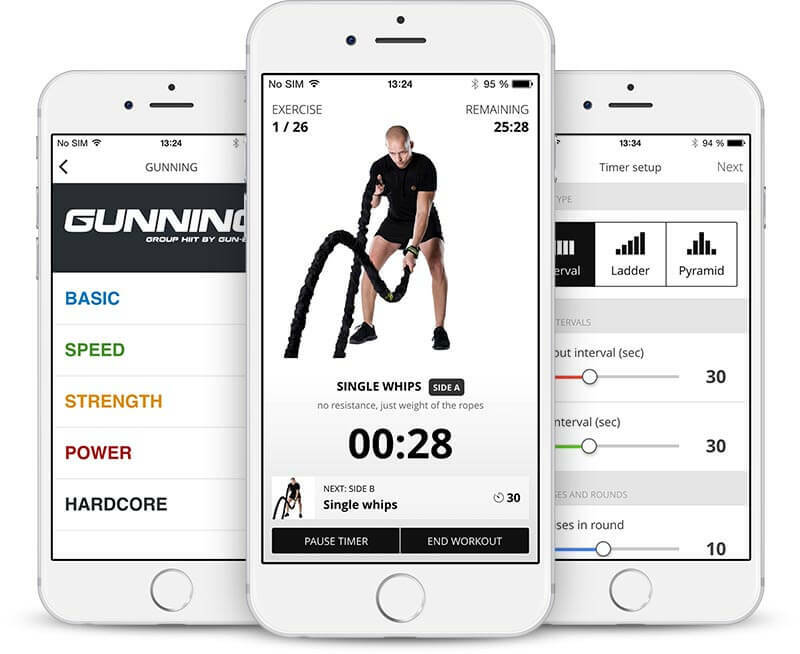 You can use our app to create workouts with other training tools! Creating a class plan was never easier. Copyright 2015 Krankfitness, s.r.o. | All Rights Reserved | All images and videos are property of Krankfitness s.r.o. GUN-eX®, GUN-eX Training System®, MAKE YOUR GUNs STRONGER™, WHIP YOURSELF INTO SHAPE™ are registered trademarks of Krankfitness s.r.o. Patents Pending.